Photographer Moyra Davey, overwhelmed by the birth of her first-born, began to read women’s narratives about mothering and writing in an effort to discover voices that articulated the ambivalence she felt as a first-time mom. From this came the idea to compile a series of narratives written by poets and writers gripped by the complexities that come with motherhood, especially for women who are also artists like herself. 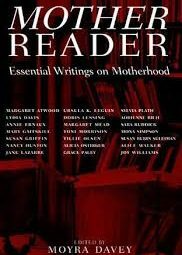 In editing Mother Reader (Seven Stories Press, 2001), Davey wanted “to bring together examples of the best writing on motherhood…that tells firsthand of the mother’s experience” (xiv). And these examples of women writers on motherhood are not for the light-hearted; they’re for the women who are ready to confess the unexpected, the unforgivable, the unsaid realities of what it really means to be a mother—especially a mother aiming at something more than just motherhood. Doris Lessing begins with the fact that taking care of children is boring and aimless, especially for intelligent women, but we do it out of obligation and societal pressure. In an excerpt from her autobiography Under My Skin, Lessing confesses that while she mothers her difficult and reserved first-born, she becomes pregnant with her second—because everyone in her society is doing it—because it is the thing to do—get them out early and be done with it. There is a community pressure that she feels—a pressure that she detests and embraces at the same time. Exhausted, she fulfills her obligations as wife and mother knowing that she is “not going to stay in this life…desperate, trapped, but behaving beautifully, doing everything [she] should” (3). She composes poems inside her head as she spends endless hours of her days pushing strollers and engaging in mindless tea parties with fellow moms, loathing the life, the tediousness, the boredom of motherhood, but throwing herself into it anyway, in spite of herself, waiting for all of it to pass and be over with. It takes courage to state that motherhood, with all its expectations and obligatory sacrifices, is like a prison, and that the children we stay home to take care of, and love with all our hearts, are “jailer(s)” that occupy our lives and keep us in line, their demands strangling us, silencing us, forcing us to place our dreams and wants on hold in place of theirs. Motherhood is demanding and dehumanizing all at the same time. Women lose themselves in motherhood; they lose their names, their voices, and their desires. Some even lose their minds, their peace, torn between wanting to be with their children and wanting to be alone; loving the little faces and bodies they’ve given birth to and wanting them to disappear for a few moments, a few days or even longer. There is guilt in saying all this aloud, but in Mother Reader, all this is said with force, with guilt-laden gumption, and with a desperation that no one understands unless she has worn the shoes of a mother. “I would die for my [son],” Jane Lazarre confides in The Mother Knot. This statement is followed by the silent “but,” the double speak that women revert to when discussing the bitter-sweet experiences of motherhood, entrenched in shameful lowering of the eyes, guilty half-felt smiles: “but he has destroyed my life and I live only to find a way of getting it back again” (75). As mothers we are torn between loving our children and wanting time away from them. If only being a mother did not entail the need for sacrificing ourselves, our voices, our potential. If only motherhood did not exist as the institution that Adrienne Rich describes in Of Woman Born. A carceral institution that binds us, controls us, demands that we become quiet and sacrificing for the needs of those we love. And from this experience, because it is ripe with ambivalence and rage, love and angst interwoven, motherhood becomes an experience we are forced to write about—writing out the pain, the guilt, the forbidden language we are told is unacceptable and unforgivable by society, by the men in our lives, and eventually, by the children we love.